Since it launched just over a week ago, the iPhone SE has seen demand outstrip supply, indicating to one investment firm that the new budget-priced 4-inch handset could offer some upside to shareholders. Analyst Amit Daryanani of RBC Capital Markets issued a note to investors on Friday, a copy of which was provided to AppleInsider, in which he said shortages of the iPhone SE both in stores and online bode well for Apple. In his view, Apple is likely to sell more than 40 million 4-inch iPhones in 2016. And while some of those will cannibalize sales that would have otherwise went to larger handsets, Daryanani believes the iPhone SE will drive 15 million more incremental iPhone sales for Apple this year. With a bill of materials estimated at around $260, and a starting price of $399 for the 16-gigabyte model, Daryanani believes Apple will achieve gross margins around 35 percent with the iPhone SE. That's much lower than margins for the iPhone 5s and iPhone 6s, which were believed to be in the mid-40-percent range. Nonetheless, he estimates that the iPhone SE could drive $6.8 billion in revenue and 23 cents in earnings per share for Apple in calendar year 2016. His estimates assume an average selling price of $450, factoring in the $499 64-gigabyte capacity. 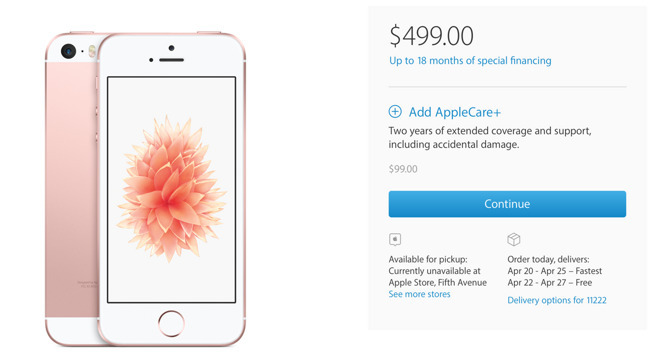 AppleInsider was first to note on Wednesday that Apple continues to see stock-outs and shipping delays for the iPhone SE. New free deliveries in the U.S. aren't advertised to arrive until April 25 through 28. Wait times are slightly shorter in China, where estimated deliveries are slated to arrive between April 19 and 22. Daryanani speculated that the lead time is shorter in China due to a higher inventory allocation by Apple, as the company looks to tap into new users in emerging markets. RBC Capital Markets has maintained its "outperform" rating for AAPL with a price target of $130.